We are excited today to announce Disqus AudienceSync: a seamless way for users to port their Disqus profile to publisher sites with one or two clicks. 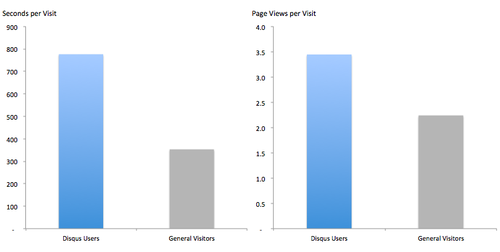 As reported by Adweek, Disqus follows similar approaches used by Facebook and Google+ and is the first discussion platform on the web to offer this technology. AudienceSync is a powerful new way to give control to Disqus users who want to participate in discussions all across the web, while giving publishers a transparent, low friction way to accrue user accounts and manage their own membership systems. It removes the barrier between growing an audience through a large discussion platform like Disqus with over 100 million profiles, and meeting site-specific registration requirements. A common point of frustration for users of standalone commenting systems is the need to create a unique profile for each site. No longer with AudienceSync. 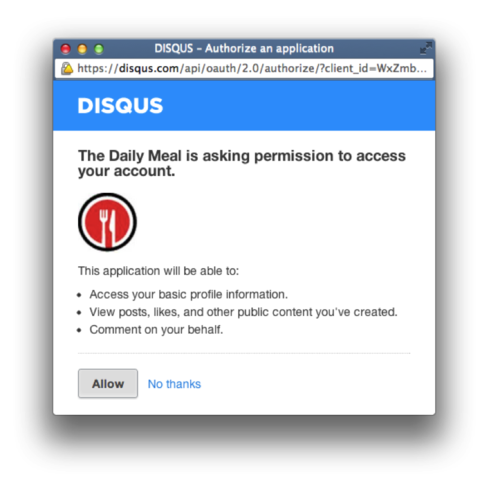 We’ve long offered Disqus Single Sign-On, allowing a site’s registered users to seamlessly use Disqus. AudienceSync is the flip side of that equation — registered Disqus users can simply click a button to grant access to their basic Disqus account information. Publishers can then create an account for them, add them to a newsletter, etc., all in a natural, opt-in flow. AudienceSync is the first of its kind in web discussion systems, allowing for a seamless, CRM-based approach to audience development with the entire registered Disqus user base. It was designed to be compatible with both in-house and third party user management systems such as Janrain, ensuring a site’s most engaged contributors are also full-fledged members able to benefit from all of the touch-points a publisher maintains with their community. Going into any product development process, we aim not only to adhere to but also promote core Disqus values like user privacy expectations, publisher TOS, and general transparency best practices. AudienceSync was no different here. AudienceSync is built on OAuth, a standard web protocol with which Web users are familiar and comfortable. Because of this, we’re able to balance frictionless, universal identity with publisher control and flexibility. You can already see AudienceSync in action on sites like The Daily Meal and Michelle Malkin. It works with any registration system and will be on many more soon. If you’re interested in AudienceSync, check out the help documentation and get in touch with us.